How often do you look at the bright side? More often than not the news we scroll on our social media feeds, receive by e-mail or watch on TV can be really frustrating. And it’s quite reasonable – lots of bad stuff is happening in the world every day. But did you ever wonder which influence can this flow of negativity make on your perception of the world and even mindset? Akhyari Hananto from Surabaya, Indonesia took this issue personally and established his own independent media, sharing only positive things happening in his country. 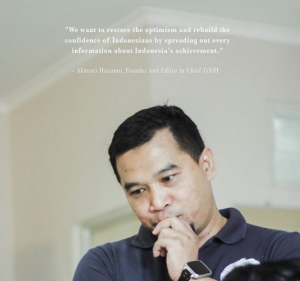 We interviewed Akhyari and you can read further to discover his approach and impact it makes for Indonesia. – My name is Akhyari Hananto. 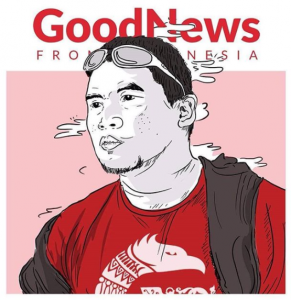 I am the founder of Good News From Indonesia. – Can you tell us more about what that’s about? – Good News From Indonesia, or GNFI, is a movement to spread positive, inspirational and educational information through the internet, namely social media, to promote optimism, positivism, self-confidence, and collaboration among young people in Indonesia. GNFI now has over 40 million monthly reaches in which young people account for more than 85% of them. – Why did you start Good News? – There was a massive spread of negativity in Indonesia following the fall of the new regime. While Press Freedom is a good initiative and Indonesia needs it, it was not used wisely by the mainstream media who tend to focus only on the negative and sensational news which get so much rating and attention. And I was so worried that over time, that negativity and pessimism will erode Indonesia’s self-confidence, optimism, and in the end, it will affect the behavior of many young people to work hard, to innovate, to have visionary thinking. Indonesia can’t afford to have that. – What are the challenges you faced when you started Good News and what did you learn from it? – Many times I was accused of being a government propagandist since I mainly deliver the good side of Indonesia. I also sometimes was judged as naive of the real condition of Indonesia. But I’ve only been delivering facts, not rumors not hoaxes, not falsenesses. Facts. The facts that have been so long hidden among bad and negative news and information spread by mainstream media. But I learned something. Despite all the attacks against me, and despite against all odd, I really have to move forward to get my goals achieved. Until now there are still many Indonesians who are skeptical about the future of this country. And I always emphasize that…you know…there are a thousand things that can make us pessimistic about Indonesia but at the same time, we have many million things that can make us proud and confident about the future of this nation. About how this nation will eventually achieve its long-term goals. – What would you tell those who look up to you? – My message is to young people in Indonesia…Indonesia is not perfect. It’s not going to be perfect. But definitely it’s an amazing nation and because of you, it’s going to stay amazing. After this interview, we assumed that Indonesia is lucky to have Akhyari, who looks up for the good things and cares enough to share them with his audience. But it’s not only about Indonesia. His message and, moreover, his approach can be related to every individual in each and every location. And it is not about being blind to all the problems and issues we face, but to never forget to appreciate the greatness and beauty of the world we live in, the country we connected to, individuals we are. Go to aiesec.org to learn more about connecting to the wonders of the world.